I know, this gadget falls under the heading of toy/tool. Indoor grow lights will take many years to pay for themselves. But I do like my homegrown salads. And I can get a jump start on the garden, harvesting lettuce in early April, instead of June, by starting my seeds indoors. Last week, I started a flat of lettuce, spinach and kale to transplant in March. I started them about a week earlier than in previous years, and am keeping my fingers crossed that I'll have a harvest that much sooner. Starting most varieties of seeds indoors needs a soil temperature around 70 degrees, and light for the seedlings for about 14 hours per day. Although these are fluorescent tubes, they do give off a small amount of heat. And by positioning the lights close to the soil, there seems to be enough heat for my seeds to germinate. 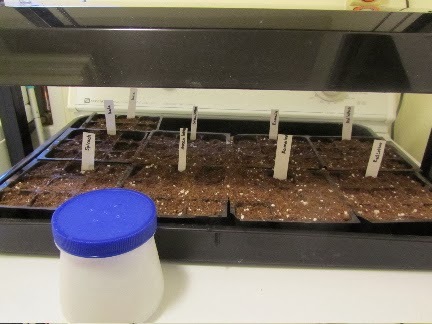 Once I had a couple of seeds sprouted, I set the timer on the light fixture for 14 hours/day. The container with a blue lid is my indoor sprinkler. 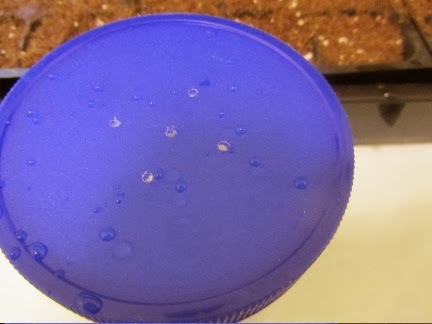 It's just a screw top plastic jar with a lid, into which I drilled a few small holes. It works well for wetting the surface of the soil for good germination of seeds. I pick my toy/tools carefully, as I don't like a lot of junk hanging around the house. As for just how long this grow light will take to pay for itself, I did some figuring. I used to buy all my tomato seedlings each spring, spending between $15 and $18 per season. The grow light set-up was about $150 (less about $20 with an e-coupon). I now start all of my tomato plants from seeds, saving about $15 per season. I also use the grow lights to get one extra planting of leafy greens started and in the ground, saving about $10-15 on buying leafy greens at the produce stand each spring. On top of these savings, I start smaller amounts of other veggies under the lights, too. My guess is this grow light will pay for itself in about 6-8 years. So, while not a great pay-back timeline, at least it's not a hobby that keeps costing me money. I'm looking forward to the gardening season. It seems so far away right now. But I know it will come soon enough! How does the saying go -- necessity is the mother of invention. I didn't have a clean spray bottle that I could use for just water to spritz the soil. This was my solution. My husband made a grow light from scrap lumber and inexpensive light fixtures. It worked great. However, the cats loved to eat the tender seedlings. Even with their own cat grasses, they wanted what I was growing. We surrounded the grow area with netting that they immediately worked with their paws until they could get in. After a few years of this, I gave up. What a handy husband! I would have loved to have something similar, and could have saved a lot of money! Your cats are too funny! It's nice that they let you live in their house! That's how we feel about the squirrels in our yard -- so nice that they let us plant cherry trees and enjoy a few of the cherries for ourselves. I think it's a great idea! Garden veggies for less expense, plus the "spring-like" feeling of growing plants. I guess I could also say that the grow lights and indoor gardening help with SAD, cheaper than a doctor's visit plus rx for anti-depression meds. I do enjoy visiting my seedlings everyday! Have you considered selling tomato starts on craigslist? That's a fantastic idea, frugal spinster! I usually just give away extra seedlings. But this year, if I have extras that look good, I think I'll try selling them. Nothing ventured, nothing gained!